Our assessment of market conditions is derived from published market reports, as well as sales conducted by Tennessee Timber Consultants. Overall, hardwood sawtimber markets remain very strong. Our hardwoood sales are generating substantial buyer interest and offers at or above expectations. Hardwood sawtimber is in high demand, while pine sawtimber continues to struggle. Hardwood log exports have taken a hit over the last several months due to increased trade tension. Nevertheless, white oak veneer logs are still in high demand and are bringing very high prices. Walnut veneer demand and prices remain high. Red oak is favorable but, as always, red oak veneer in Tennessee is mainly sought after in East Tennessee. Quality hardwood sawtimber is in high demand due to increased demand for all grades of lumber. White oak has continued to strengthen primarily due to increased stave demand and strong white oak markets across the board. Red oak prices decreased slightly in the second half of 2018, but overall, prices are still high. Tracts containing oak species have attracted high interest. Soft hardwoods and tie quality sawtimber, including gum, maple, and ash, has also remained strong. Yellow-poplar demand and prices remain strong for all grades. 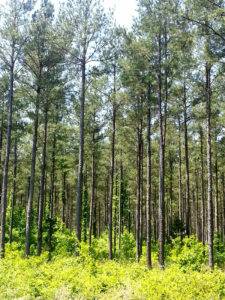 The southern yellow pine sawlog market has been struggling for nearly a decade; however, prices and demand for pine sawtimber appears to have strengthened over the last several months. Due to multiple mill closures in the region over the last couple of years, Pulpwood is currently in low demand across the board and virtually all producers are on limited delivery quotas. Typically, these prices fluctuate on a month-to-month basis depending on weather and availability, but will likely remain low for the foreseeable future.